Home › News › Tyre labels what do they mean? To many a tyre is simply a tyre, to anyone on the road they can be the difference between life and death. The tyre is the only thing that connects us to the road, poor tyres, poor connection which will can inevitably lead to serious problems. That’s why in 2012 the EU introduced standardised tyre labelling so consumers not only could understand better what they are buying, but also compare tyres easier. On new tyres you’ll see a label much like the one below. The first part of the label on the left hand side refers to fuel efficiency or rolling resistance. The greater the rolling resistance the less efficient the tyre is, which equals it will cost you more in fuel. The best is an ‘A’ rated tyre, the worst being a ‘G’ rated tyre. The difference between the best and worst in terms of fuel consumption can be as high as 7.5% for cars. This may not seem that much to some but if you spend £50 per week on fuel the worst tyres could easily cost you in the region of almost £200 in additional fuel. The second part on the right relates to grip in the wet. On some tyres with low rolling resistance wet grip can be compromised, meaning poorer handling and stopping in wet conditions. Under strict conditions each tyre is test to understand it’s wet grip performance. Overall the difference in braking distance between best and worst (A to G) will be around 30%. With difference between grades of tyre being between one and two car lengths when braking from 50 mph in the wet. Lastly the at the bottom of the label is all about the sound the tyre generates when moving. There are 3 levels, the first (one sound bar) means the tyre is 3dB better than the future European limit. The second (two sound bars) shows that the tyre meets the future European limit. 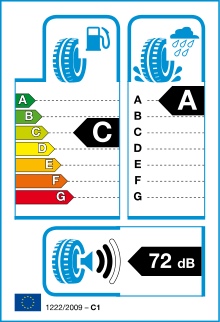 The third level (three sound bars) indicates that the tyre only meets the current European limit for noise. So how does this impact on your choice of tyre? Obviously buying tyres very much depends on available budget, some people simply can’t afford a premium tyre. However it may pay dividends to stretch to the very best tyre you can afford. 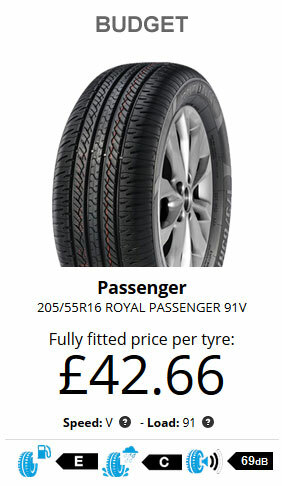 The Premium Tyre is twice the price almost than the budget tyre. However consider this, often Premium Tyres last longer than Budget Tyres, more importantly the Premium Tyre is ‘A’ rated for fuel efficiency, whereas the budget tyre only ‘E’ rated. So it’s fair to say if you put in over £50 worth of fuel per week the Premium Tyres could save you a tidy sum over the life of the tyre. 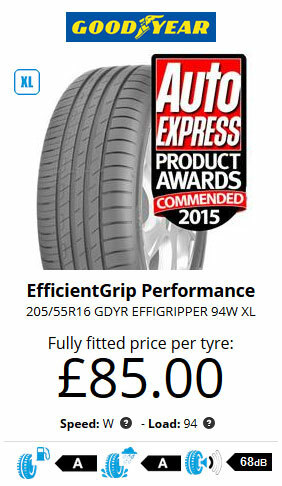 Coupled with this fuel saving, the Premium Tyre is considerably better in the wet. This equates to you stopping 3 to 6 car lengths sooner than on the budget tyres that’s between 18ft (5.5m) and 36ft (11m) sooner! No matter how much you drive most of us would prefer to stop 36ft sooner than hit anything. We ask, what price safety?